In order to avoid biased policy conclusions based on an unrepresentative selection of case study information, the WP5 assesses the relevance of transfering results obtained from case studies to other European regions. This methodology also help understanding what is the influence of experts selection of case studies in comparative research projects, and question the local experts potential to rate the case study circumstances within a wider setting. The method includes 2 different sub-method for assessing case studies representativeness. 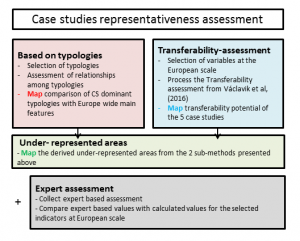 One based on the comparision of agricultural and cultural features of European landscapes, and the second one follows the steps proposed by Vaclavik et al (2016) for calculating transferability potential. Both allow to derive maps of under-represented areas, i.e. areas that are not easily assimilable to the features of the 5 case studies. Finally, the final step is dedicated to the assessment of local experts potential for rating the case study circumstances within a European setting. Template used for collecting experts based assessment. Many rural landscapes in Europe deal with competing demands for land, at a cost of trade-offs between multiple objectives, such as food production, ecosystem services and biodiversity. Understanding and balancing these trade-offs to promote sustainable landscapes has a high priority on the policy agenda. While these trade-offs are highly context-specific, place-based studies that focus on local specificities of trade-off mechanisms are currently missing, particularly with involvement of stakeholders or local experts. However, the regional and local policy context as well as the relations between and attitudes of stakeholders are highly relevant for trade-off assessments, as these factors strongly influence the options for the management of these landscapes. A TALE synthesis workshop is held back to back to the Landscape 2018 conference in Berlin, on 12 March 2018. The workshop focussed on the following question: How can trade-offs between food production, biodiversity and ecosystem services be effectively managed at a landscape scale? TALE D5-3 reports on the project synthesis, as discussed during the workshop.